A person whose thoughts and conversation are conventional and commonplace. Also, a commonplace saying, trite remark, conventionalism; a soothing statement. slang (orig. U.S.). As for the crab-prince ad copy, it’s an entertaining piece of puffery with a fondness for capitalization in unexpected places (as in the Nasty Pig PlaySheet ad here). 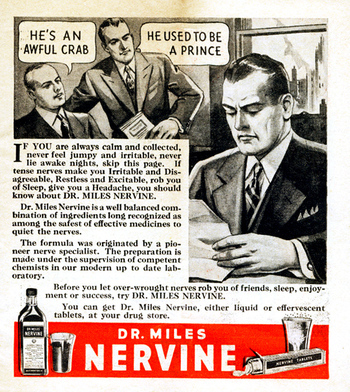 And no, the ingredients in Nervine were not in fact “among the safest of effective medicines to calm the nerves” (see above). This entry was posted on December 18, 2010 at 10:54 am and is filed under Language in advertising, Metaphor. You can follow any responses to this entry through the RSS 2.0 feed. You can leave a response, or trackback from your own site. 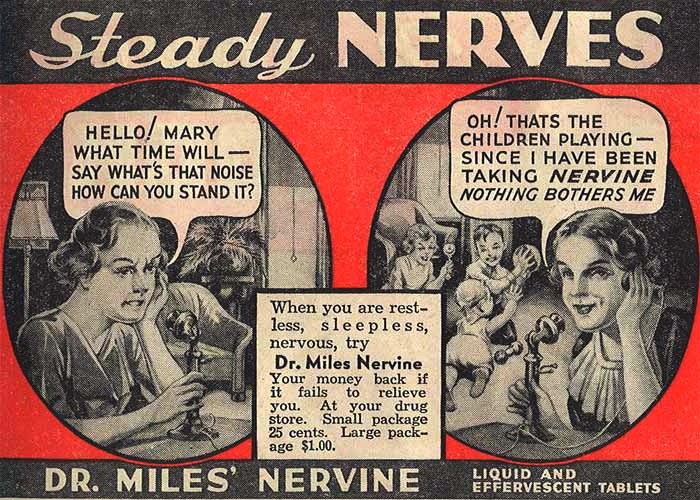 how could you NOT want relief from nervousness or nervous exhaustion, sleeplessness, hysteria, headache, neuralgia, backache, pain, epilepsy, spasms, fits, and St. Vitus’ dance?? Or, for that matter, to be reduced to the lobotomised calm of Mary with the noisy children? Cue the Rolling Stones’s “Mother’s Little Helper”. This made me go watch The Babbitt and the Bromide again. Oh my, oh my. Fred Astaire and Gene Kelly, doing a thing on (among other things) masculinity. 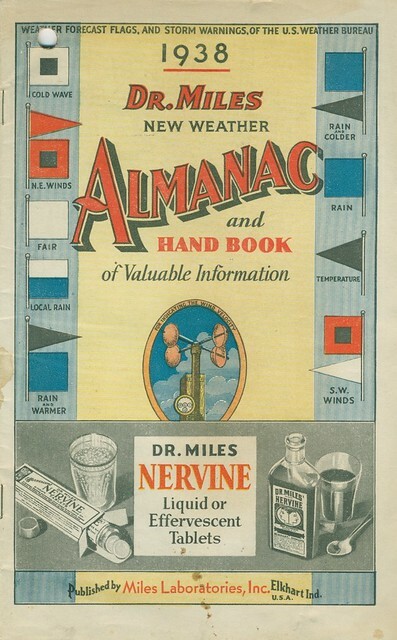 Unlike many Victorian era patent medicines, this stuff actually worked, against diarrhoea: I can see it now, a little hexagonal blue glass bottle, “one or two drops in a wineglassful of water.” And it did work. Now the two ingredients I remember are chloroform (!) and extract of opium. No wonder the authorities clamped down on it. Miles Nervine was wonderful! It really worked to calm my nerves and without any side effects whatsoever. Wish they still manufactured it. I recently found some boxes in my mom’s attic that held large paper dolls. These cutout dolls are approx. 2′ in height and the names on the back are Dorothy (Dolly Quincy) and Katrina Knickerbocker. Each cut out doll is beautifully illustrated with three complete costumes. The copyright on each doll is 1902. The dolls were promotionals. If you mailed in one wrapper of any of Dr. Miles Remedies and five 2 cent stamps it would be mailed complete, postage paid. Is there a market for these dolls? I’m interested in selling. I’m not the person to ask; ebay is the place to go. Though there probably is a market for the dolls; it’s amazing what you can buy and sell on ebay. medicines. I just found a small Weaverene ointment ad in a 1934 Clewiston Paper: ” Weaverene Ointment at Clewiston Drug Stores, For Grounditch and Athlete’s Foot 25 c(ents)”. Others were “Willing Worker” for constipation, “Burnene” for burns and one for worms. Also he had a roach killing powder he sold by mail to people all over the state who swore by it: “Roachene”, with boric acid. I have a ledger with a lot of their letters, and a sales postcard with a photo of my mother, her brother and a cat: “Safe for kids and cats.” He was married to Pearl Hendry, granddaughter of Capt. F.A. Hendry. Dr. Weaver was also Superintendent of Schools. He was from Indiana, where he went to medical school, and died in the early 1950’s. They were married about 1917.